Following the conclusion of a five-day ‘Training of Trainers’ programme, 24 persons from villages in the Mabaruma sub-region are expected to return home as trained facilitators of the Hinterland Employment Youth Service (HEYS) programme. The training programme began last Tuesday when Minister within the Ministry of Indigenous Peoples’ Affairs Valerie Garrido-Lowe travelled to the Region One town to roll out the HEYS programme. The five- day interactive session was held at the Broomes Estate Guest House in Mabaruma and saw persons travelling from villages such as Kamwatta, Whitewater, Bumbury Hill, Red Hill, Hobodia, Yarakita and Hotoquai to be a part of the session. Earlier this year, Garrido-Lowe had told Stabroek News that once the 2016 budget is passed and the necessary allocations made, the training of facilitators for the HEYS programme would be priority. 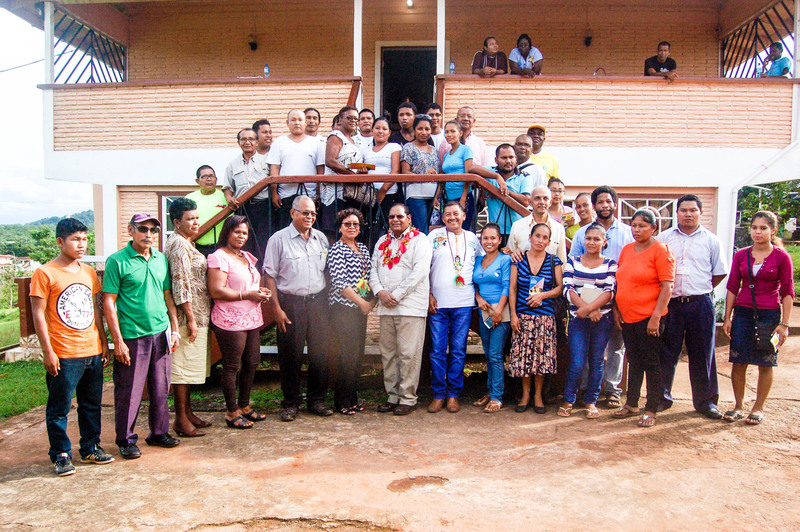 Prime Minister Moses Nagamootoo (front, centre) along with Minister within the Ministry of Indigenous Peoples’ Affairs Valerie Garrido-Lowe and Minister of Indigenous Peoples’ Affairs Sydney Allicock flanked by representatives of the region and the newly trained facilitators of the Hinterland Employment Youth Service (HEYS) programme. She noted that such persons would be required to undergo a training session related to methods of delivering the curriculum in a youth-friendly and engaging way, after which teams would be assigned to specific locations. Present at the simple closing ceremony last week was Prime Minister Moses Nagamootoo who noted that the training session plays an integral role in the efficient delivery of vocational training to the participants of the HEYS programme. He said it was President David Granger’s mandate to have the programme modified from what it was once, in reference to the Youth Entrepreneurship and Apprentice Programme (YEAP) that was commissioned by the previous PPP/C administration. “This project has been modified from what it was before because we have been receiving billions of dollars for the Amerindian Fund but all they had with the billions of dollars was not the utilization of funds, all they had was fun, they used up the money with bacchanal and were gallivanting with it rather than developing skills,” the PM charged. “We will try to bring training so that the children who will benefit from the programme will feel that they merit the money they are receiving as stipend. It is not a hand out, it’s not a gift, you are not being trained to become professional mendicants, you are not treated as paupers or beggars, you are treated as persons with intellect. Your reward will be coming in the form of higher education and opportunity for scholarships,” Nagamootoo asserted. Acknowledging that job opportunities in Guyana’s hinterland regions are limited, Nagamootoo opined that the HEYS programme offers indigenous youth a chance to develop skills that would enable them to better elevate themselves. “I believe that when you deal with the hinterland, you are dealing with a reality that you cannot hide. For too long indigenous peoples and the other people living in the hinterland have been considered to be just the bush people, the children of the forest,” he said. Pointing to radio broadcaster Michella Abraham-Ali who hails from Nappi in Region Nine, the PM revealed that many years ago, she was a participant in a journalism training programme which later propelled her to become one of Guyana’s best radio personalities. “Those people who have come before and said that Amerindian people need handouts, they were not helping Amerindians, they were insulting you. They felt that if you are given money, you could see the happy life for a few days of the month and then you go back to being nothing,” Nagamootoo said. With this in mind, the PM explained that the HEYS is meant to convert the money into training and it is hoped that those with special skills and an interest in wanting to go forward will be afforded opportunities to attend tertiary learning institutes such as the Guyana School of Agriculture, the Kuru Kuru Training College, the Critchlow Labour College, and the University of Guyana. Nagamootoo went on to explain that while a stipend is being paid to participants, it is to be used to afford participants to attend the courses and not to do political work on behalf of the any political party. “We are not asking you to wear a red shirt and (to try) to take over the work of the regional councillors or trying to replace the Toshaos or the councillors in doing their work. That’s not what we want, we are not trying to politicise you, we are trying to give you learning and relevant skills for life,” he said. Additionally, the PM pointed out that employment does not only mean finding jobs in somebody else’s business but also includes self-employment. He emphasised that job creation plays a pivotal role in community development. “Some places you go you can’t find a plumber or you can’t find someone to construct a septic tank…the skill you will be getting will be skills for life and that is how we believe you will be able to develop communities,” he said. With this in mind, the PM highlighted agro-processing as being a sector with great potential for the Region as it has the resources and capacity to be successful once developed. “Here in Wauna, you have the best palms, perhaps in the best in the whole of Latin America but yet we cannot produce enough oil for the market…if we have young people trained with the relevant skills, we would be able to have a successful agro industry,” he declared. However, in the meantime, government is hopeful of being able to develop technical institutes in all interior areas where it is possible to do so, Nagamootoo said. Another pillar in community development is communication, the PM added even as he pointed to the commissioning of Radio Mabaruma which was also done last Saturday. He said that the radio station presents the people of Region One with a long overdue opportunity to be up-to-date with what is happening in the rest of the country. He added that it is also expected that as the radio station develops, the rest of Guyana would also be able to hear what is happening in Region One. Further, the PM disclosed plans to have The Learning Channel be used to air televised programmes of national interest as another means of keeping the whole of Guyana up-to-date with current affairs. According to Nagamootoo, this would see residents being able to watch programmes such as presidential addresses and debates in parliament. Speaking on behalf of the Region, APNU+AFC councillor, Pamela Ann Ford offered her praise to the government for developing the HEYS programme. “In the past, our young people were fooled and only received a monetary contribution but today I am happy to say that youth in Region One from the various communities will be trained in their various skills and they will in turn make a difference in each of their communities,” she said. “Participants, you have a great role to play. We expect nothing less than progress and development, when you perform Region One will stand firm,” she added. Meanwhile, Garrido-Lowe apologised for what she said was a delay in bringing the HEYS programme to Region One. She said that HEYS is a programme with a difference as it is one that builds capacity to empower youth by providing them with skills that would earn them incomes. “Our youth must have the skill to earn wherever they go so that they can build a proper life. This programme is going to help our youth,” the Minister said. Out of recognition of the need to provide opportunities to meaningfully engage indigenous youths in a manner that would enable them to earn an income in the pursuit of sustainable livelihoods, the HEYS programme was launched last October in Paramakatoi Village, Region Eight by the Ministry of Indigenous Peoples’ Affairs in collaboration with the Ministry of Education. The programme, which runs for one year, targets indigenous youth between the ages 18-35 years for self-development through skills training. It is intended to facilitate in-house and practical training during the first half, with another six months’ attachment to an office/organisation in a field that is relevant to the students’ area of study. Since its launching, HEYS has expanded to several other indigenous villages across the country and is expected to be rolled out in the Moruca sub-region today.